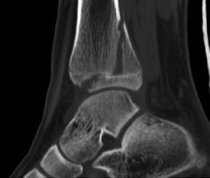 The Salter-Harris IV fracture is one in which the fracture pattern involves not only the growth plate, but the shaft of the bone as well as the distal (end) of the bone, and extends into the joint as you saw in the Type II fracture pattern. Obviously, this injury is a bit more serious than the Type I or Type II in that now there are three concerns: healing of the fragment of bone shaft, the potential for growth plate injury and the effects of the fracture on joint surface cartilage and overall positioning of the cartilage surfaces within the joint. While there may be a case, in some instances, for non-treatment of non-displaced fracture components involving the shaft of the bone in the Type IV fracture, one must remember that that piece, too, involves the growth plate and the goal in children’s fractures, especially those involving joints and growth plates,, is to restore “normal” anatomy, position and alignment to the extent humanly possible. The picture to the left is a CT scan image of an ankle. It is a lateral, or side view, image which illustrates how the fracture line extends from above the growth plate, through it and through the end of the bone into the joint. This image also shows a fair degree of displacement of the fracture. Fractures that are displaced can often be treated by simple closed reduction (“setting” the bone) and casting or splinting. However, when a substantial portion of the joint surface has been compromised, such as is seen frequently in the Type IV injury, restoration of the integrity of the joint is critical and can require surgical fixation, typically with one or more screws, to provide solid fixation and maintenance of position throughout the healing phase. Surgical fixation of the “intra-articular” (into the joint) fracture component must be accomplished without further violation of the growth plate, as even placement of pins and screws across a growth plate ( also known as a “physis”) can cause enough injury to alter the normal development of bone growth at the physis.